Hypothesis confirmed! Street fundraisers are, in fact, annoying New York. But before you get all “d’uh” — data collected over the past few weeks also suggest that peskiness has little to do with their success or lack thereof. If a very small, unscientific sampling of New Yorkers (roughly 0.000003% of the city’s population) can be trusted, charitable organizations have reason to dispatch street fundraisers. 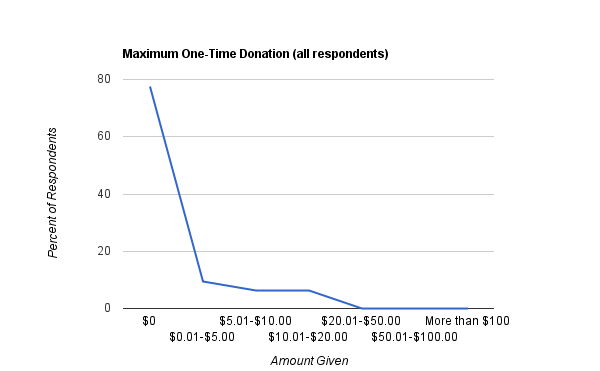 Fewer than 23% of the folks surveyed had ever given to a street fundraiser, but that’s a pretty decent rate, even with small-dollar donations. Perhaps more significantly, people who gave didn’t find the fundraisers any less annoying than did their counterparts. 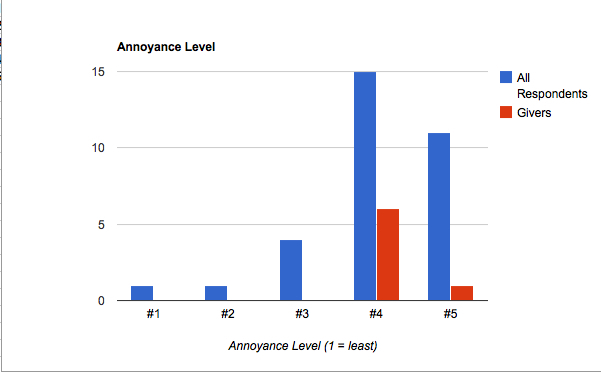 At second glance, this might not be surprising, backing up the match between low annoyance level and low guilt level, but it shows that being annoying isn’t hurting business. And for those of us who don’t care to let the pests win? Avoidance strategies have been developed, many depending on the (real or fake) urgent cell-phone call. Have no fear about the etiquette; one respondent confessed to having briefly worked as a street fundraiser, and said that the experience left him feeling that politeness was unnecessary. For me personally? While I still cross the street to avoid fundraisers if I can, I now give my five dollars to my favorite causes via their websites. A quick “I already gave!” is an easy solution. No shame, no delay, and — bonus! — no retort. This entry was posted in Survey Analysis and tagged analysis, annoyance, charts, fundraising, graphs, on the street, results, survey. Bookmark the permalink.